Forge New Alliances in the War for Vigil! Grab some friends and compete for dominance as two-player teams. 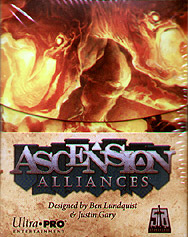 Ascencion: Alliances brings multiplayer to all your favourite Ascension sets! New Banner cards give your alliance powerful effects for both players! Ally Unite keyword brings a new twist to a fan-favourite mechanic! Converts ANY of our existig Acension sets into a multilayer team exerience!